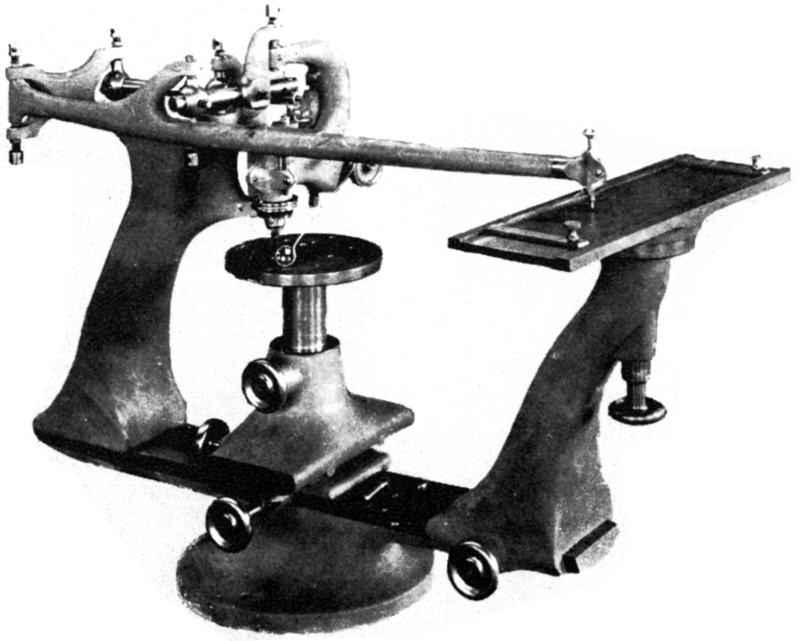 Who produced the first modern, commercially-available pantograph engraver? It seems certain that, with the first patents registered in the United Kingdom (41692), the United States (2066588), Germany (G56157), France (768273) and Switzerland (176691), it was the company of Taylor, Taylor & Hobson - their early sales literature making that claim apparently unopposed. Indeed, the first German-made Deckel and American Gorton engravers were all licence-built or developed copies of the Taylor-Hobson. 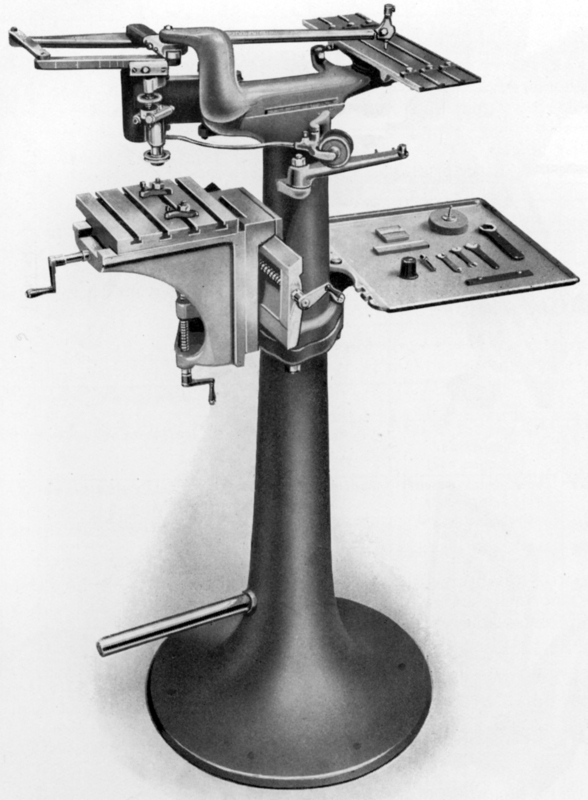 Deckel, in particular, was to eventually develop a number of sophisticated, "Universal Die Sinking Pantograph Engraving and Copying Milling Machines" all of which were to became market leaders in their field. 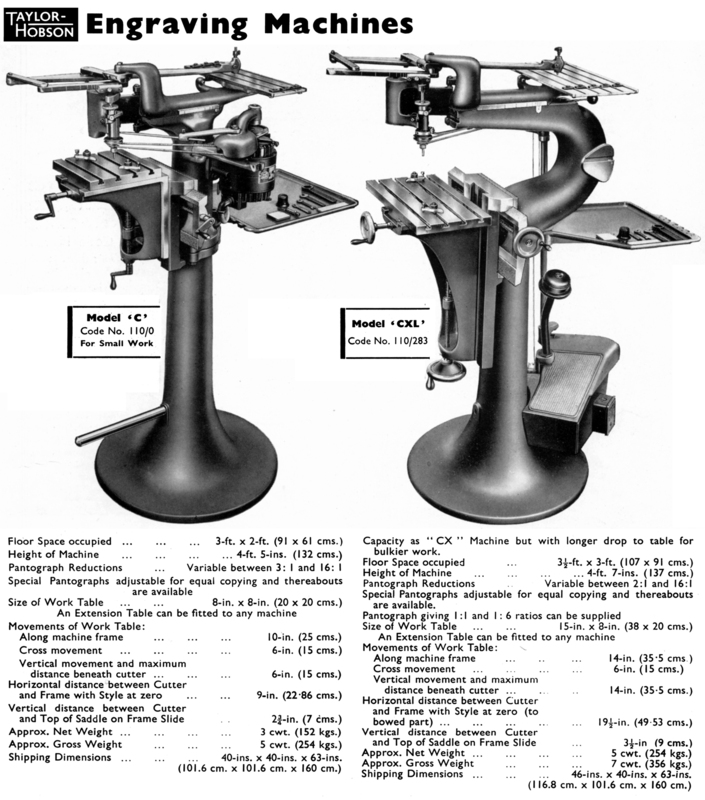 Gorton too developed a range of beautifully-made machines including 2-dimensional types as the lighter P1-2, and P2-2 for general work, the heaver P3-2 and the 3-dimensional much heaver P1-3 and P2-3 for 3-dimensional jobs such as die and mould work, stamp cutting and light-duty vertical milling. Founded in 1886 by two brothers, the optician Thomas Smithies Taylor and engineer Herbert William Taylor as T.S. & W. Taylor, the company's was based first in Slate Street and then in much larger premises at Stoughton Street, both in the city of Leicester. The brothers' first products were lenses, intended to meet the rapidly expanding demands of the photographic trade - the first salesman to be appointed in 1887, being W.S.H. Hobson with the company becoming, at some unknown date, Taylor, Taylor & Hobson - often abbreviated to TTH. In earlier years the company (like many other smaller concerns) were happy to diversify. 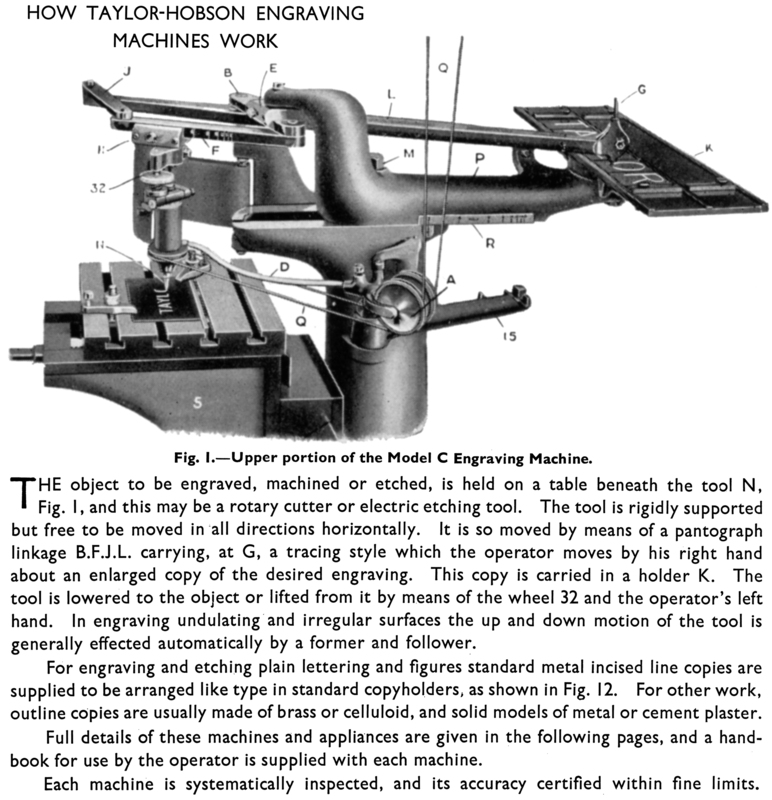 Early advertisements, from 1887-88, stated that they were "Electric Light Engineers and Contractors, Makers of Special Machine Tools and of Optical, Electrical and Scientific Instruments" and, a year later, "Engineers and Scientific Instrument Makers - Inventors and Designers of Machinery - Machine Work a Specialty". Formed as a limited company in 1901, by the 1930s the company's advertisements had expanded to include not only one-off specials for various industries but also regular production items as toolmakers' microscopes, profile projectors, alignment telescopes, electro-limit gauges, engraving machines, Javelin electric etches and Cooke (patent) lenses and prisms. Enjoying enormous success, the lens side of the business expanded to such an extent that by the 1939 some 80% of the world's film studios were using their products, especially in Hollywood where it was reported that they had a virtual monopoly. 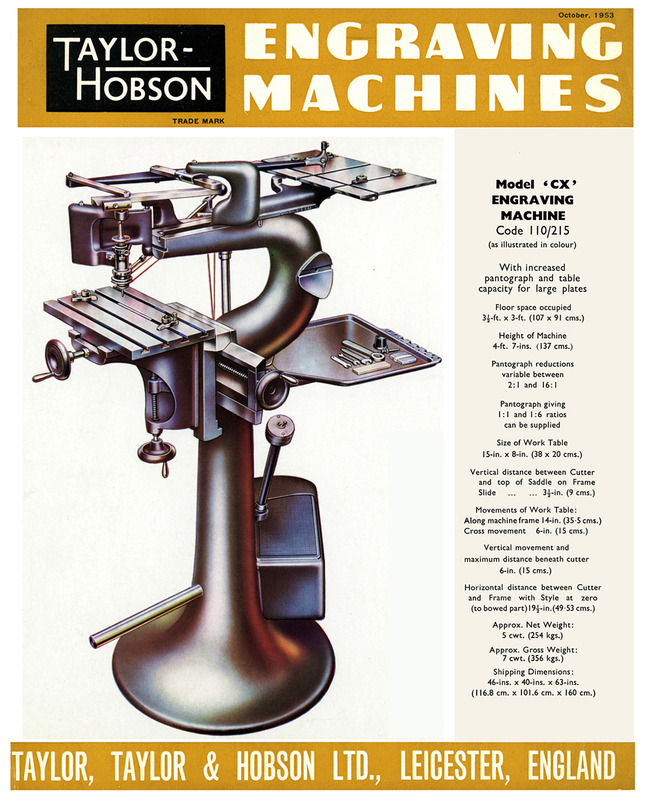 From 1940 and onwards Taylor & Hobson were to develop a series of high-quality, precision measuring and inspection machines including two world firsts: in 1941 the Talysurf 1 for surface texture measuring and, in 1949, the breakthrough Talyrond 1 for measuring circularity with hitherto unheard of accuracy - an instrument subsequently to be widely used in engineering production plants. 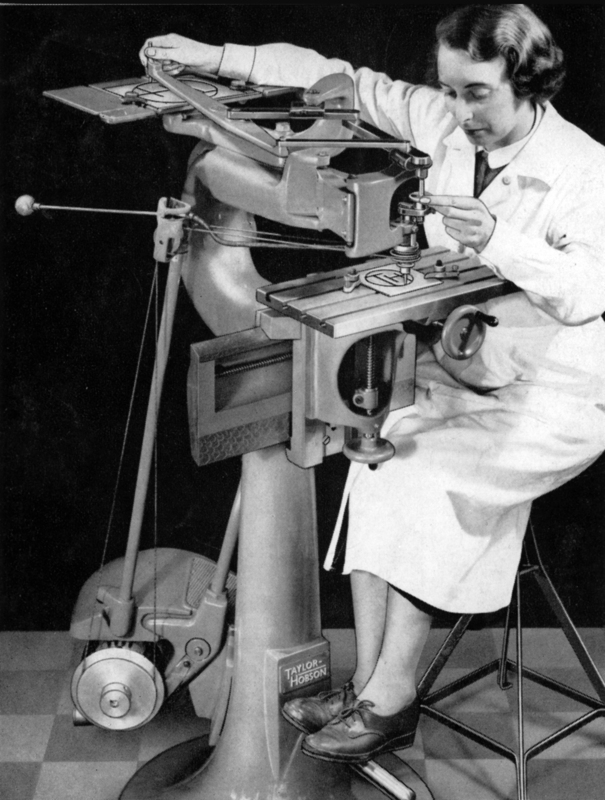 In 1947 the company was acquired by British Optical and Precision Engineers, part of the Rank Organisation who were only known to the general public as producers of films. After a management buyout in 1980 from Rank, the engraver side of the company (but not the far more important ultra-precision metrology division) was reformed as Newing Hall Ltd., the name being derived from that of its three directors, Derek Ingham, Wilf Hall and Trevor Newton. Based in Leeds, the next development was the computerisation of the Pantocut, a machine produced in prototype form in 1978 and designed to be heavier than other models with the capability of full profiling and milling capabilities. Today the precision measuring division is in the hands of an American company, Metek Ultra Precision Technologies who have branches throughout the world. The first pantograph engravers manufactures were obviously the result of Herbert Taylor's fertile imagination and energetic drive, and would almost certainly have been developed to engrave lens mounts and similar items. The sheer usefulness of the engraver was immediately apparent and soon - at the expense of those involved in the hand engraving trade - orders were coming in from all manner of industries, the new machine able to engrave almost anything that could be cut whether flat, circular or irregular in shape. Eventually, by using an electric etching head, sold for many decades as the "Javelin", it was even possible to mark items made of hardened steel, the process able to replace the far less convenient but widely-used acid etching. One multi-head Javelin unit, installed in the Sheffield works of Walker & Hall Ltd., could electric-etch the maker's name on fifteen knife blades simultaneously, the company reporting with satisfaction: "One-fourth the time and about one-fifth the cost of the old acid etching". The head unit of the Javelin was originally intended to be used on the C, CB. CX and CXL machines but just as easily be fitted to the later "A", 2D", "JH", "JR" and K Types and even other makes of engraver - though the mounting stem (it simply fitted in place of the normal cutter head) would have needed modification. The engraving unit was, in effect, a small electromagnet switched on and off rapidly by a solenoid acting on a pair of contacts. The "magnet" took the form of a copper rod tipped with a tungsten spike, this wearing element being available in four sizes marked 5, 7, 10 and 14, the number indicating the diameter of the tungsten spike in thousandths of an inch. The rod was held against a spring clip and, as the current was switched on and off the spring reset the rod - the effect being to make it vibrate rapidly up and down through a travel of 1.8". In order to change the frequency of vibration and so make the unit suitable for marking a variety of materials, a single-phase transformer was supplied that could output between 2 and 8 volts. Over the years the transformer changed, the first being neat, round unit with a cast-iron case fitted with a lifting handle and a handy voltage-selector switch. Later types were less convenient, being in a sheet-steel box with plugs that had to be inserted in sockets marked with the various voltages. The Javelin is a truly useful tool and even today many are still in use - a instruction manual is available. 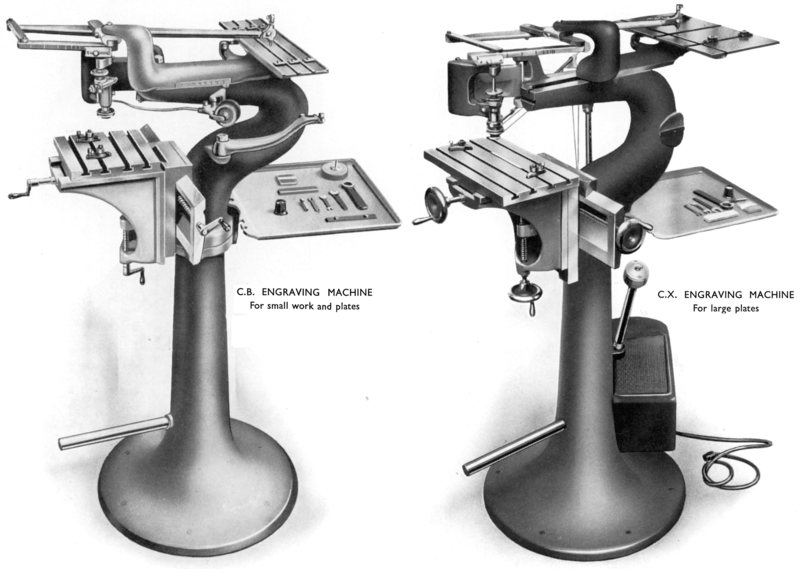 In addition to 2D engraving, it was quickly realised that, as a down-feed could be fitted to the cutter head of the pantograph - and a corresponding adaptation made to the tracing stylus assembly - it was possible to use the engraver in a 3D form; the result was a machine that became known as the "die sinker", another idea patented by Taylor, Taylor & Hobson. 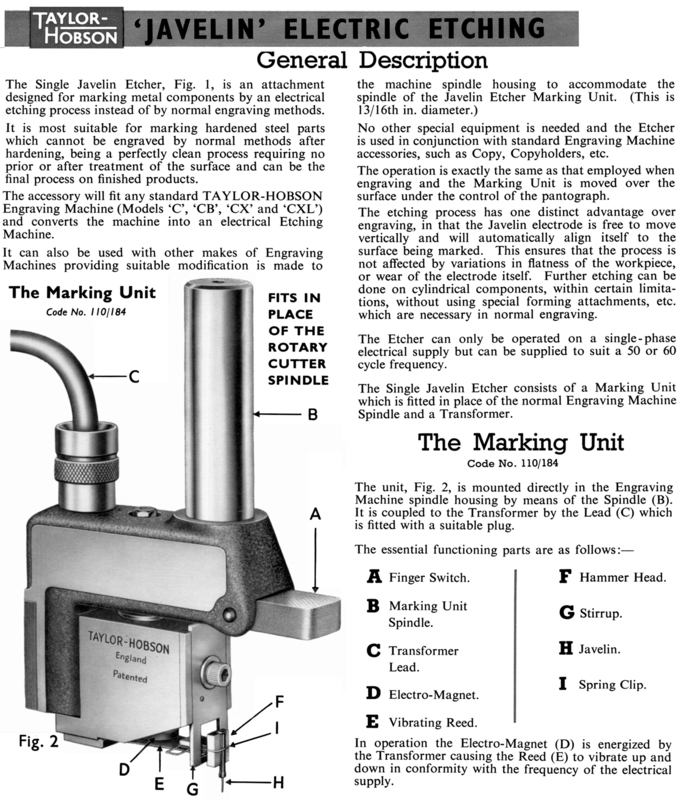 While the die sinker could not produce a truly smooth surface, it revealed much tedious hand work, leaving a skilled man to put the final smoothing touches to such items as drop-forging and moulding dies..
By the 1970s, with the Company in the hands of Leeds-based Rank Opics Machine Tool Group and the pantograph engraver line consolidated around the new Pantocut, the Model Mk.2 K, the less expensive floor-standing Model D and the compact, bench-mounted Model A - a machine with the same head unit as the Model D but intended for just small flat work. However, most of the wide range of accessories offered in previous years continued to be available, including built-on and separate tool and cutter grinders; ordinary and tilting rotary tables; the Javelin and Graphic-Etch electrode-type engraving heads; the two 18,000 r.p.m. 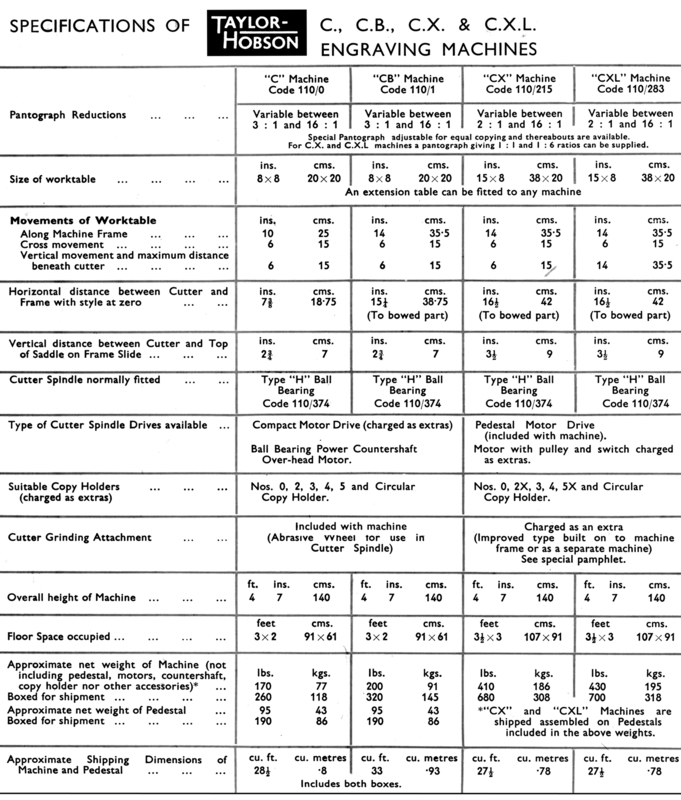 spindles; the Type K; with pre-loaded bearing to take the Taylor-Hobson "Axiflat", "Rigiflat" and "Trutaper" cutters; the general-purpose Type L spindle (fitted as standard to the Model K and D machines) for parallel-shank collets (the maker's designations for cutter heads changed over the years with some being referred to by just their part number); a diamond marking tool; machine vices; an extension table and extension bars to hold larger jobs; a rapid-feed attachment that lowered the cutter with a 1/4 revolution of a control lever; a milling and forming attachment with a spindle that was spring-loaded upwards to allowed the Model K to do light vertical milling and engrave on slightly curved or contoured work; a deep-throat conversion unit (just an extra link arm fitted into the cutter frame; a forming attachment that allowed the cutter to be guided over curved or undulating work; micrometer collars to fit the Model D and older machines originally supplied without and a presser foot, a device made from hardened steel that rested on the work surface near the cutter that gauged the depth of cut on undulating surfaces that tended to buckle. 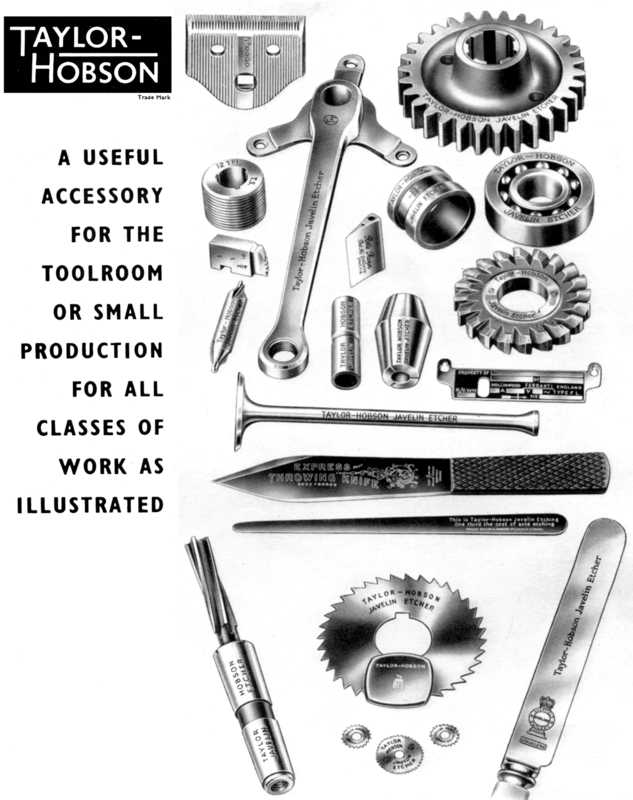 A detailed catalogue of all Taylor-Hobson pantograph engravers accessories and attachments is available. Larger and more versatile than the basic Model "C" - the Taylor Hobson Model "CX" as sold from the late 1940s until the 1960s. 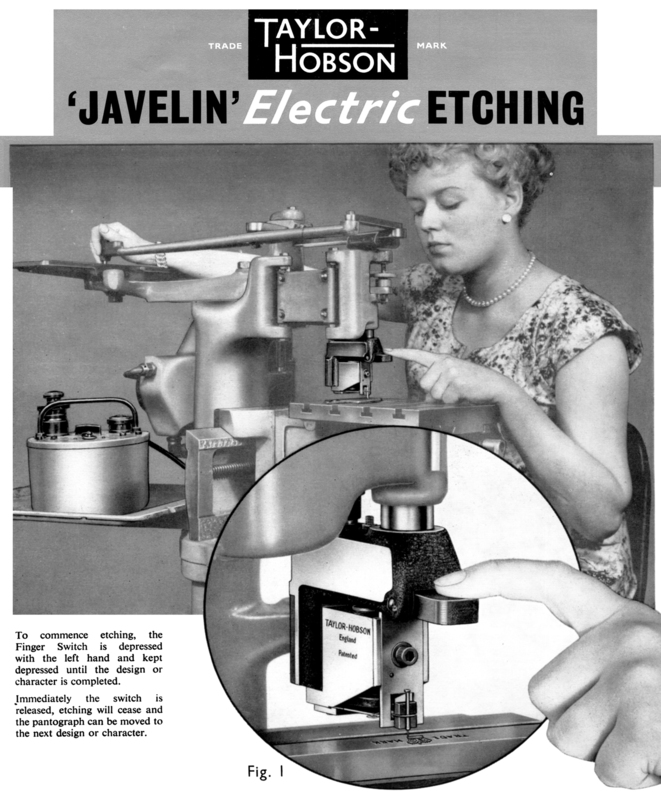 By using an electric etching head sold for many decades as the "Javelin" it was even possible to mark items made of hardened steel, the process able to replace the far less convenient but widely-used acid etching. One multi-head Javelin unit, installed in the Sheffield works of Walker & Hall Ltd., could electric-etch the maker's name on fifteen knife blades simultaneously, the company reporting with satisfaction: "One-fourth the time and about one-fifth the cost of the old acid etching". The head unit of the Javelin was originally intended to be used on the C, CB. CX and CXL machines but could also be used on the later (and superb) K Types and even other makes of engraver - though the mounting stem (it simply fitted in place of the normal cutter head) would have needed modification. The engraving unit was, in effect, an electromagnet that was switched on and off rapidly by a solenoid acting on a pair of contacts. The "magnet" took the form of a copper rod tipped with a tungsten spike, this part being available in four sizes marked 5, 7, 10 and 14, the number indicating the diameter of the tungsten spike in thousandths of an inch. The rod was held against a spring clip and, as the current was switched on and off the spring reset the rod - the effect being to make it vibrate rapidly up and down through a travel of 1.8". 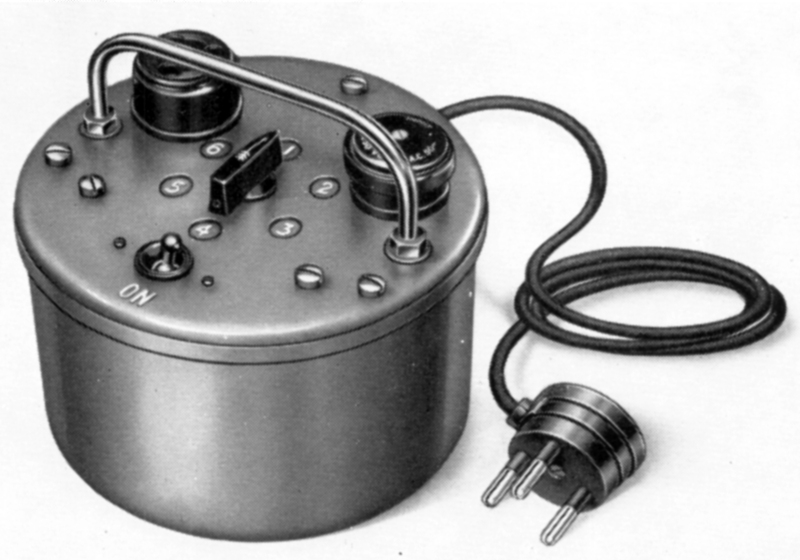 In order to change the frequency of vibration and so make the unit suitable for marking a variety of materials, a single-phase transformer was supplied that could output between 2 and 8 volts. 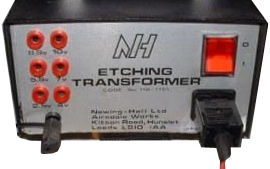 Over the years the transformer changed, the first being neat, round unit with a cast-iron case fitted with a lifting handle and a handy voltage-selector switch. Later types were less convenient, being in a sheet-steel box with plugs that had to be inserted in sockets marked with the various voltages. The Javelin is a truly useful tool and even today many are still in use - a instruction manual is available. A very early "Taylor, Taylor & Hobson" engraver. Although the London Science Museum holds an example of this machine, they date it as being from 1870, but as founding company, T.S. & W. Taylor, did not start in business until 1887, their dating is, presumably, incorrect.